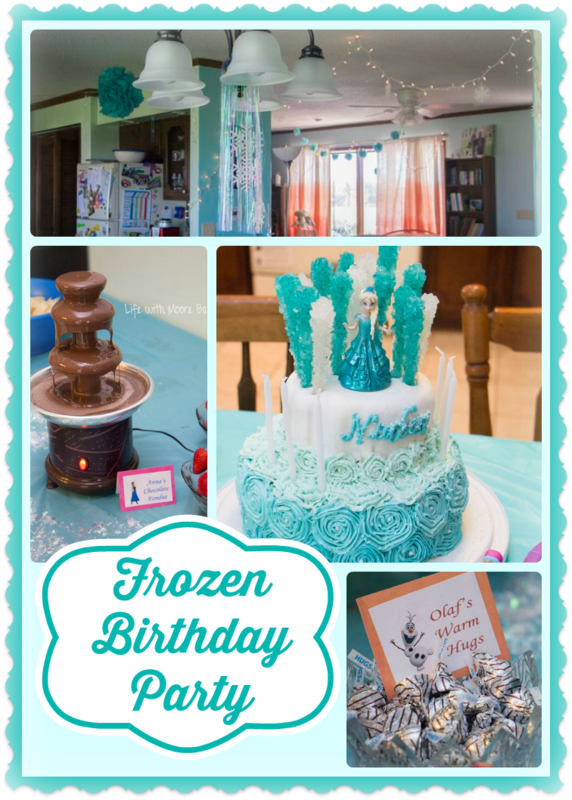 It was birthday time in our house again, and ever since last December when we saw the movie Frozen, Nadia was determined to have a Frozen party! Almost a year later that was still her theme of choice! 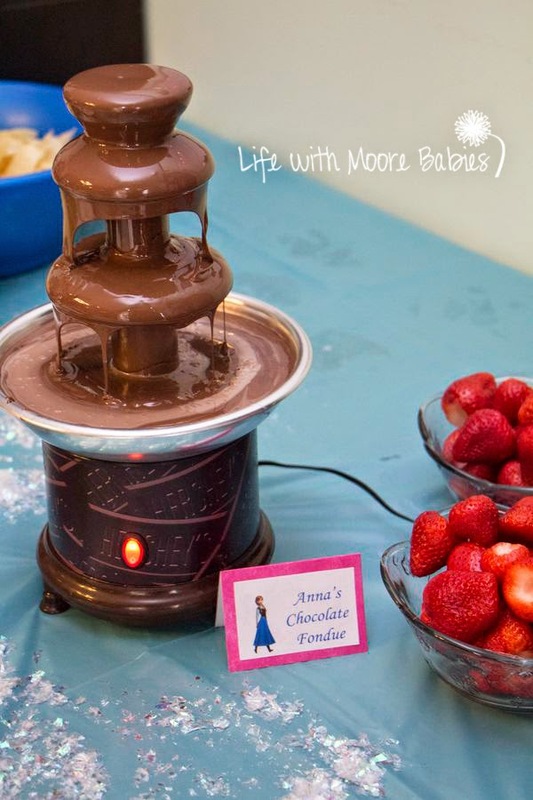 Luckily for me about every other little girl has had a Frozen party this year, so ideas abound! 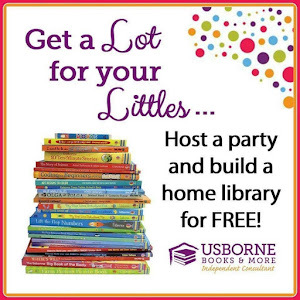 I was able to find some adorable invites FREE over at Homeketeers! Decorating was pretty easy this time of year too since Christmas decorations are already in stores. 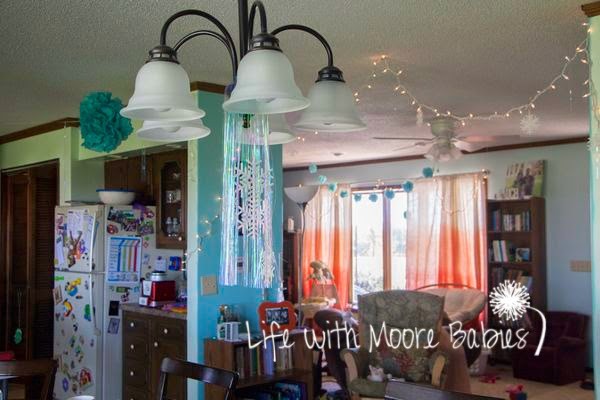 Some twinkle lights, snowflakes, and tinsel, and you have a personal winter wonderland! 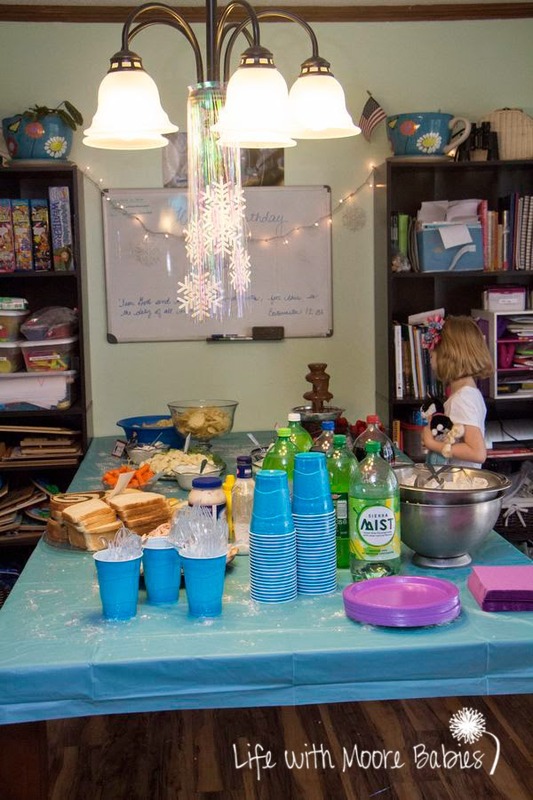 She also chose an Elsa blue for most of the decor, but went with purple plates and napkins for Anna. As a side note I haven't figured out why everyone prefers Elsa when Anna is the hero; seriously girls, I hope you understand this when you get older and don't just gravitate to the pretty dress! Food was pretty easy for this one. 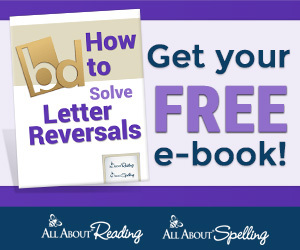 There are only a couple foods mentioned in the movie, so I started with those: "Finish Each Other's Sandwiches" and "Anna's Chocolate Fondue." 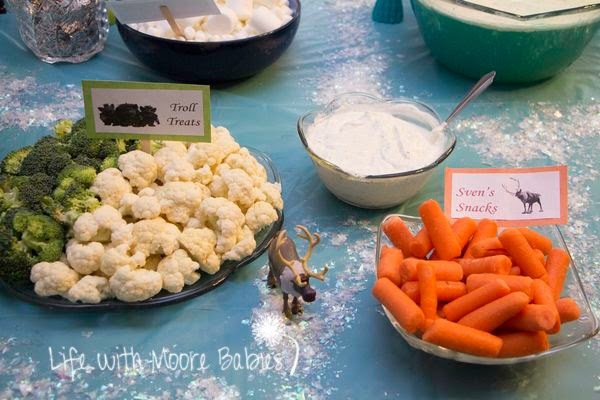 We needed some veggies, so our carrots became "Sven Snacks" and broccoli and cauliflower were "Troll Treats." 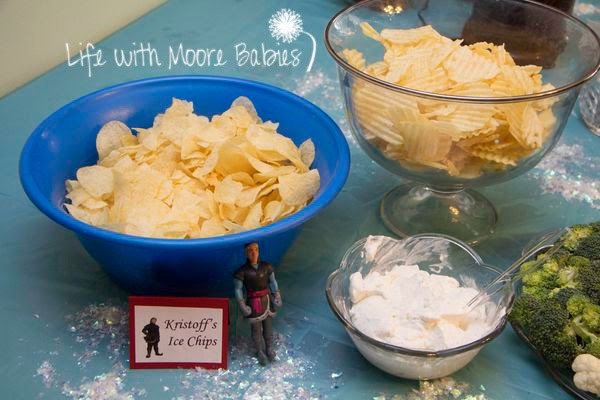 I had planned to use pretzels either as antlers or snowman arms depending on the shape, but my husband requested chips and dip, so we ended up with "Kristoff's Ice Chips." 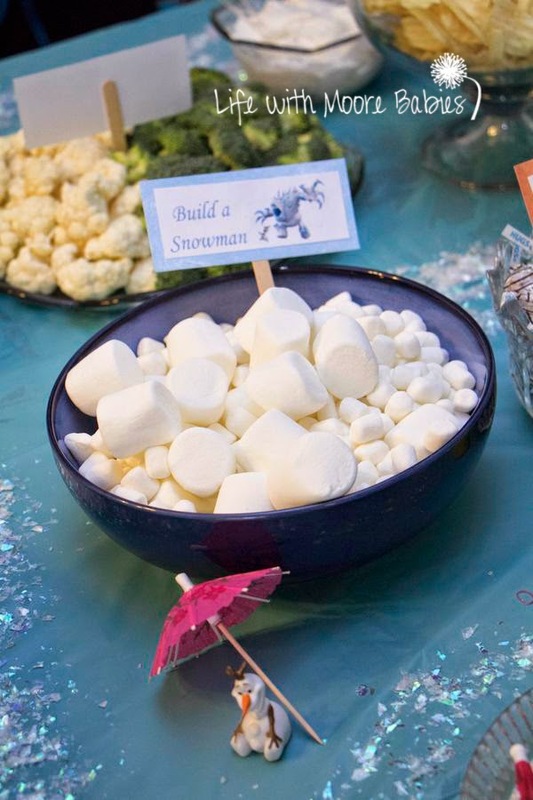 And you can't leave out the snowmen we had marshmallows to "Build a Snowman" (conveniently located near the chocolate fondue) and "Olaf's Warm Hugs." 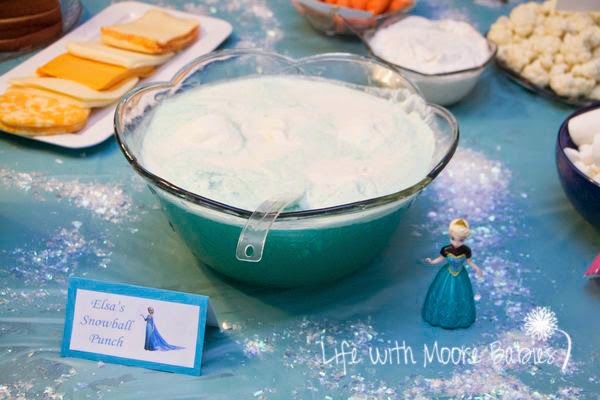 Elsa had her own "Snowball Punch" (recipe from Comfy in the Kitchen). 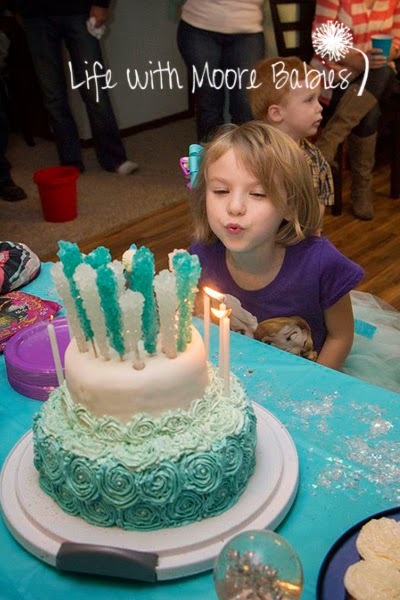 Of course Elsa also took the cake! 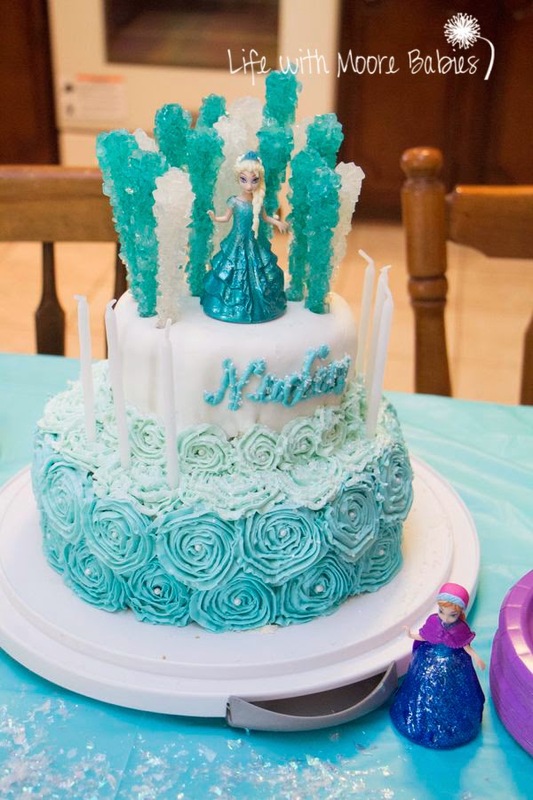 Nadia chose a cake with ombre blue swirls on the bottom and a rock candy ice castle on top. Lucky for me it was actually surprisingly easy to decorate! 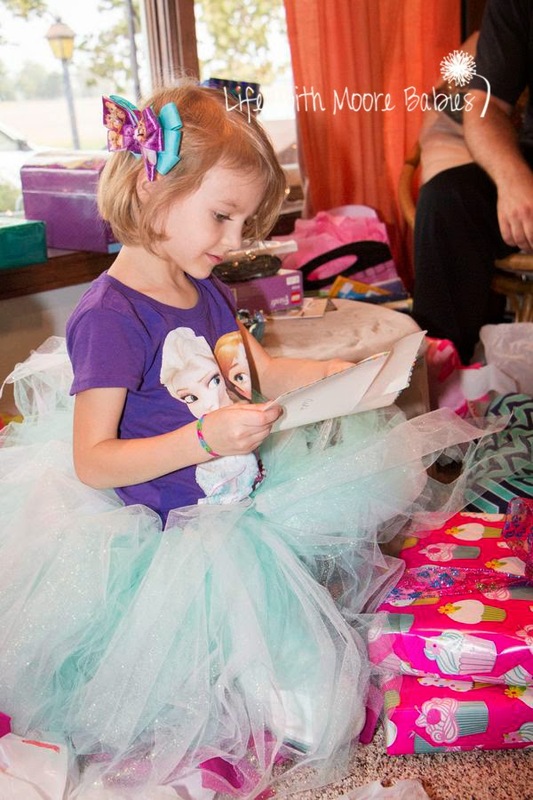 The main issue I ran into with the cake (and also an issue that has made me question my sanity in throwing birthday parties) was realizing 2 days prior to the party that my children did not own a small Elsa doll wearing the appropriate dress. Seriously! Luckily they have an adult in their life who adores them and was willing to drive to like 5 different stores looking for one (it wasn't me either)! In the end she came up with this Elsa which was much closer, but all the correct Elsa's were still sold out! How can that be when the movie came out nearly a year ago! Anyway, Nadia was quite pleased with the cake, and it turned out pretty yummy too! 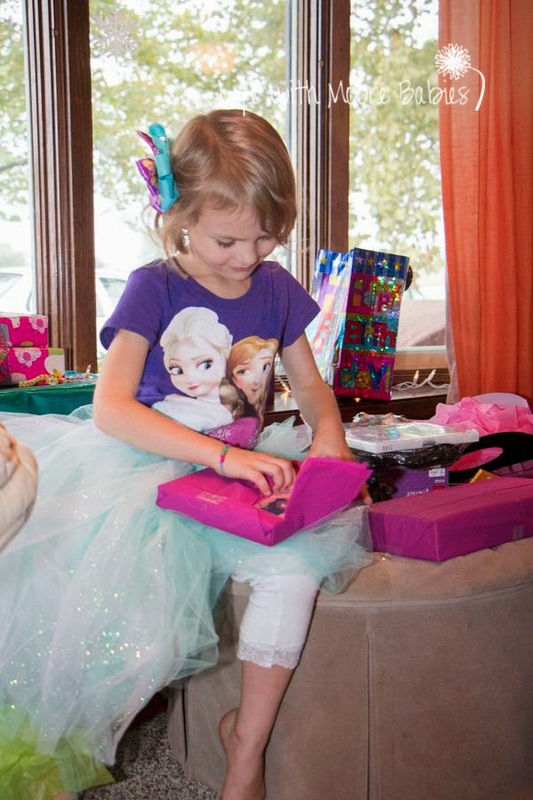 She was super pleased with all her gifts as well! Really she seemed to have a great time being a princess getting all the attention and of course wearing her super poofy Elsa tutu. 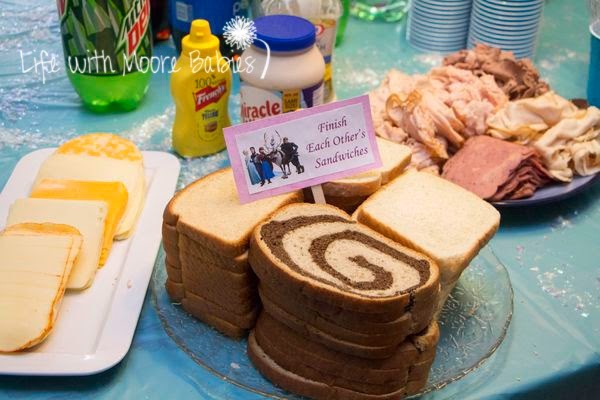 I never got a good picture of the favors. 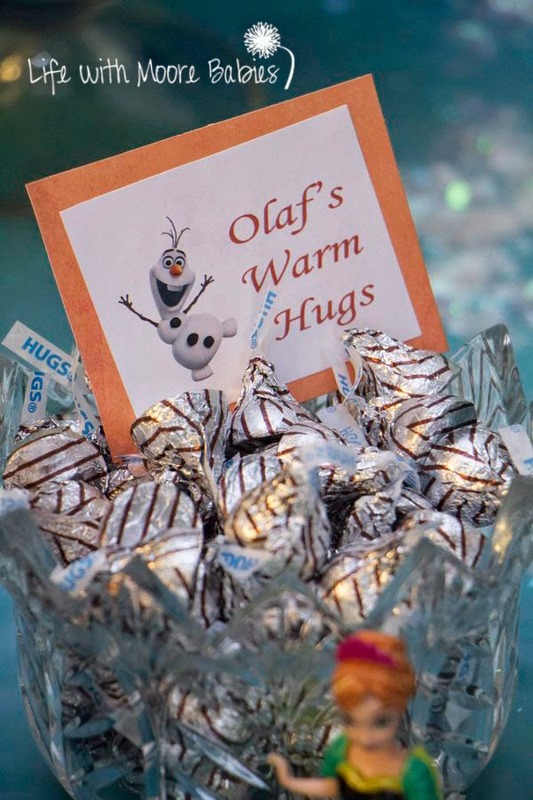 I made the kids a baggie of Erupting Snow as well as a baggie of Sparkle Slime, and of course also sent them home with rock candy and Olaf hugs! I hope they all enjoyed their sensory fun! Now I am left deciding whether I want to take my winter wonderland down or leave it through the winter! 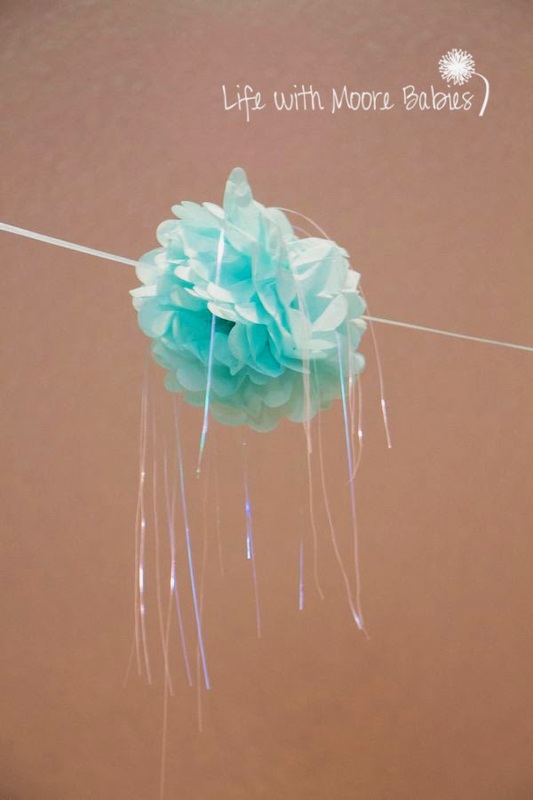 How long do you leave up party decorations?